There are a number of craft beer bars in the centre of Málaga, but in the interest of avoiding the crowds, we’re holidaying a couple of miles away in Pedregalejo. We could make the trip in, but … oh, look – there’s a bar just half a mile down the road from us. La Variopinta is a cosy bar next to a heaving Irish pub. Run by two women with a background in homebrewing, it’s only been open a year, but already seems to do just about everything right. There are three kegged beers at the bar, plus a fridge full of interesting bottles from all over the world. There’s also enough room for a kitchen, so tapas and slightly larger dishes are available on request from a handwritten menu. The food is excellent, and contains many options for vegetarians and vegans (not always so easy to find in Spain). But it’s the beer we’re here for. On tap are: Pilsner Urquell, the classic Czech pilsner; MalaPinta (Bad Pint / Bad Look?) a quaffable pale ale with a quartet of zingy American hops; and MalaVida (Bad Life) a honking great 9.5% imperial stout, which manages to be smooth as silk thanks to the addition of maple syrup. For a small bar, La Variopinta has a very spacious toilet, or at least it would be if it wasn’t filled with kegs of beer ready to go on after the current ones are exhausted. And so on to the bottles. 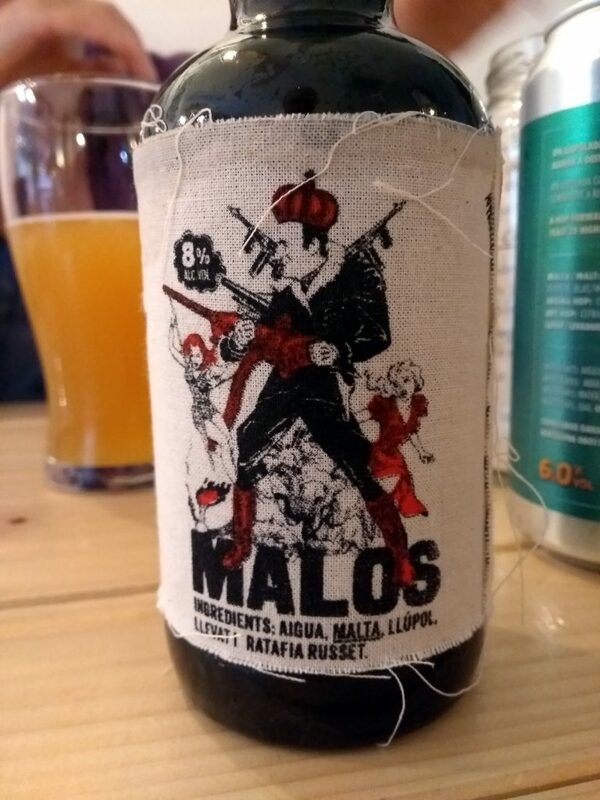 Los Reyes Malos (The Bad Kings) clearly fancies itself as something special, arriving, as it does, in a bottle with a wax seal and cloth label. It’s another imperial stout, but almost completely devoid of the roastiness you might expect. Instead it has a caraway or aniseed character – unusual and rather sophisticated. Soup is a Spanish take on the New England IPA – hazy with Vermont yeast that softens the Mosaic and Citra hops (two of my favourites) into something very laid back. Choco Dope claims to be a ‘cinnamon hazelnut cookie double porter’. Not sure about the cookie, but the cinnamon is definitely there. And, blimey, it’s another strong one. By the time the owners have plied me with another little freebie of their 9.5% stout, I’m ready to go home. Which direction is it, again? If you find yourself on the Costa del Sol, you have to check this place out.